NZ’s charter school experiment is proving to be even more expensive than first thought, as two schools have experienced falling rolls since the start of the 2014 school year and three remain below what is termed their “Guaranteed Minimum Roll” for funding purposes. As a result, the number of students enrolled has fallen to 358 across the 5 charter schools and the schools will now receive an average of $20,878 in funding this year. But the argument that this is only a “niche” is in stark contrast with ACT Party policy. The ACT Party wants to expand the charter school programme and ultimately convert all state schools into privately operated charter schools. The arguments behind the establishment of NZ charter schools have always been weak and the Working Group led by former ACT Party President, Catherine Isaac, never produced a written report. This is in contrast to former ACT MP John Banks’s claim in parliament that we could learn from the successes and failures of charter schools overseas. But with no written report from his former party president, we simply don’t know how the NZ model supposedly does this. Whangaruru from 63 to 56 and Vanguard from 104 to 93. Students may well have left the schools for justifiable reasons, such as joining the military, in the case of Vanguard, but the funding implications are clear. Under the terms of the charter school contracts, each school is funded for the full year at a minimum level set in advance at the start of the year. Whangaruru is funded for 71 students and Vanguard is funded for 108 students. In addition, the primary school, Rise Up Academy, is funded at a level of 50 students but has only 46 students as at 1 July. So across the 5 charter schools, total student enrolment has fallen to 358 and the average minimum operational funding cost per student for 2014 has increased to $20,878. 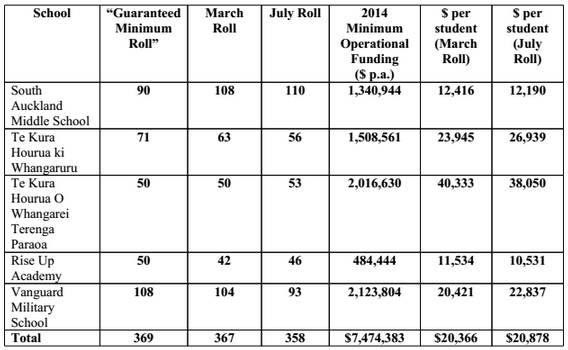 In practice, actual funding per student may be higher than these estimated figures, if the school roll has exceeded its “guaranteed minimum roll”, as the contract stipulates funding will be set at the greater of the two. One further aspect that disturbs us, is that the Vanguard Military School is sponsored by a for-profit family owned company. Will the fixed revenue stream be spent on the remaining students or will it fall into the Income Statement of the Sponsor? QPEC reiterates its call for a review of this controversial policy as it is clear that it is nothing more than a political stunt. QPEC also wants to see a major review of school funding take place after the election. It is time to re-examine all aspects of school funding and to seek a more equitable basis for funding our most deserving students and the community schools that serve them. We have an opportunity to help level the playing field for the most disadvantaged children. Let’s give all our children the greatest possible opportunity to succeed. Great stuff, this. Here in Nova Scotia, Canada, I am also fighting the good fight against Charter schools. This will help. Thanks!